Masdar (fourth right) with SK Mata Parang senior assistant (co-curriculum) Sajeli Sarpawi, organising committee and the participants at the end of the competition on Wednesday. KUCHING: SK Mata Parang were victorious at the Majlis Sukan Sekolah Rendah Samarahan U12 Rugby Tournament when they beat defending champions SK Empila 24-17 in the final at SK Tebelu, Sebuyau on Wednesday. It was a sweet revenge for SK Mata Parang who lost to SK Empila in the final last year. The playoff for third and fourth placings saw SK Tungkah Melayu triumphing over Zone Sebuyau A. Other participating teams were SK Asajaya Laut, SK Moyan Laut, SK Temiang, SK Seruyuk and Zone Sebuyau B. 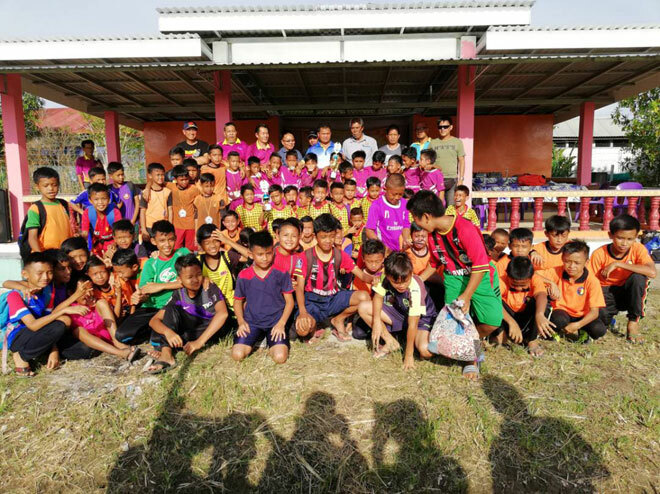 Chairman of Majlis Guru Besar Zone Sebuyau Masdar Paiman, who is also SK Tuanku Bagus, Sebuyau headmaster, closed the event and gave away the prizes. Masdar was pleased to note the increase in the number of participating teams from four last year to nine this year. “This is a good sign that rugby is getting more popular in Samarahan and the increase in participation is due to the fact that a Samarahan team represented Sarawak at the national MSSM championship last year,” he said.